The difference between myself and my friends is only a few years, a few miles and a few numbers. By years— my parents migrated to the U.S. in the mid to late 1970s when it was simple to secure work authorization and a social security number, especially if you worked for the airlines in the Bahamas, as my dad did. He just walked into the immigration office and signed up for an SSN. By miles—I live in a city that is just 689 miles from Haiti, 200 miles from Cuba and only 50 miles from the Bahamas. So close in proximity yet far enough for certain dreams to be deferred. By numbers—my social starts with 59. This indicates that I was born in Florida. At times, I wish I could lend my friends these numbers to alleviate, if just for a day, their feelings of fear, dread and uncertainty. President Trump, my friends, my colleagues, my interns and my students are not much different than myself. They are smart, funny, educated, civil, hard-working and they are just as American. We share similar values, a Christian faith, a hunger for higher education, a spirit of entrepreneurship and a desire to change the world for the better. Mr. President, you have now asked Congress to “do their job” as it relates to this legislation. A job that they failed to do for years while my high-achieving students and friends languished in low-level jobs and outside the walls of colleges they couldn’t afford. The day you announced your decision to end the DACA program I received a panicked phone call from a former employee of this magazine -- the brightest and hardest working talent who had ever walked through our doors. She started as an intern, became an editorial assistant with us, then a PR assistant and then left after a few years to obtain a job at a New York PR agency. I knew she was an asset to our company yet, after I learned of her immigration status, I couldn’t help but think – how is it I never found an “American” with this sort of fierce work ethic? She was one of the many DACA youth who had come to the U.S. before they were 16 years old, had continuously resided in the United States since June 15, 2007; were in school, graduated or had obtained a certificate of completion from high school or were an honorably discharged veteran of the Coast Guard or Armed Forces of the United States; they were never convicted felons and have never had any significant misdemeanors. A simple recipe for success. They just needed a clear path. The aforementioned was the criteria to apply for DACA. But, Mr. President, had you ever considered why that criteria produced young people like my former employee? Well, it’s not a coincidence. These young people think like, talk like, dress like, move like the best American citizens because they rubbed shoulders with the most high-achieving Americans at their schools. Yet, their immigration statuses have caused them to always hope against hope, pushing them to surpass many of those high-achieving American friends. The truth is, one should never underestimate what hope can do to the human spirit…it can spur you on to achieve the impossible. It is the story of the immigrants that built this country from the ground up, as I wrote about in HOLA AMERICA: Guts, Grit, Grind and Further Traits of the Successful American Immigrant. Regardless of a hazy future and your talk of a merit-based immigration system, these students charmed their teachers and guidance counselors. They were voted by their fellow students to become student council presidents. They became school valedictorians. They were college ambassadors. They are church leaders. And, because of DACA, they are now working professionals. They stick out. Just ask the fellow Americans who have had the pleasure to work with, study with, worship with and be friends with them. Our jobs, schools, churches and cities wouldn’t be the same without the contributions of these 800,000 young people. 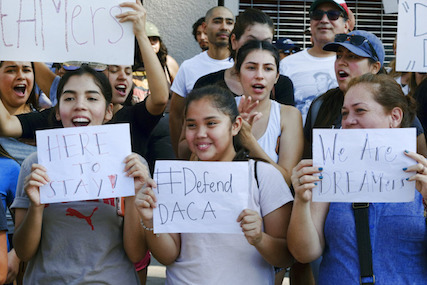 The reason the Obama administration chose to deploy DACA by Executive Branch memorandum—despite the fact that Congress affirmatively rejected such a program in the normal legislative process on multiple occasions – was because Barack Obama knew the value that this type of human being, this type of “American” could bring to the workforce. I know firsthand as I have taught DACA students, I’ve employed H1-B workers and have hired undocumented workers. I can tell you the truth. Our economy is the better for it. Those words assaulted me at first but then I began to understand. If she’s more qualified than her contemporaries, it would behoove us to create a pathway to citizenship for her. And if these dreamers are anything like my former employee (and I know they are), we’re going to the top with them. So, why not take them and her with us? TIffani Knowles is the managing editor and founder of NEWD Magazine. Her hope is to become as "newd" as possible on a daily by embracing truth, authenticity and socio-spiritual awareness. She is bi-vocational as she is the owner of two businesses and a professor of Communication at Barry University in Miami, Florida. She is also the co-author of HOLA America: Guts, Grit, Grind and Further Traits in the Successful American Immigrant.